Bronson Koenig does Bronson Koenig things. Huge 3-pointer and a quick timeout by Wisconsin with the deficit cut to one. Nice look for Koenig who drops a three. RU 44, UW 43. Last timeout for either team. Timeout on the floor after Bronson Koenig hits a clutch 3. Koenig hits 3 and #Badgers within 44-43 with 32.4 left. And away we go. ???? Bronson gets a good look. Wisconsin forced to foul. Johnson to the FT line. Fourth foul on Happ as Koenig misses open three. Wisconsin had a golden chance to take the lead. Steal by Showalter and Koenig can't hit the wide-open 3-pointer. Rutgers to the line. Happ ties it to send it to OT. That escalated quickly. This game doesn't deserve overtime, but that's where it's headed tied at 45. Because regulation is simply not enough! Happ with a pump fake low-post bucket with 2.0 left to send the game to overtime. #Badgers force OT as Happ scores inside with 2 seconds left. Rutgers' Johnson misses heave at buzzer. 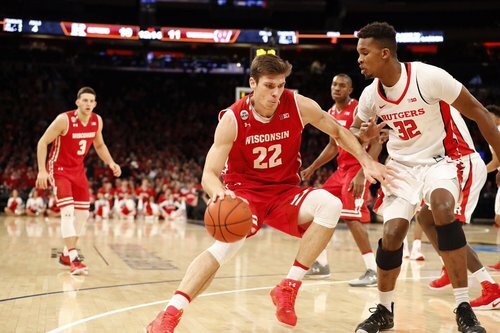 If I'm Rutgers, not failing Ethan Happ is a huge blunder. We're going to OVERTIME at @TheGarden ! If I'm Rutgers, not fouling Ethan Happ in that situation is a huge blunder. Oh well. OT coming up. Let's make this OUR five minutes. Happ wins the tip to start OT. Hayes gets his first FG of the game. Happ and one. 27 points and headed to the line. What a show for the sophomore @TheGarden ! Wisconsin holds a 49-48 lead in overtime. Big rebound by Hayes to keep possession. Happ has a career-high 29 points. #Badgers up 51-50 with 2:36 left. Showalter fouls out with 1:54 left. UW up three. Zak Showalter called for his fifth foul and he'll have to sit the rest of this one out. Zak Showalter fouls out with 1:54 left in overtime. Four points on 2-for-4 shooting and 5 rebounds. RU now shooting 65% from FT line. Badgers shooting 57%. And one for Hayes. Has been much more assertive in OT. With a sweet pass by Ethan Happ to Nigel Hayes, who converts the layup and has a chance at a 3-point play. Wisconsin now leads 56-52 with 1:33 left to play in overtime.